Very nice set..... dont know why i never got it earlier?!?! If anyone has any holoflash's they want to trade let me know.... i have one spare and a bunch of commons!!! Do not try and bend the spoon. That's impossible. Instead only try to realize the truth. 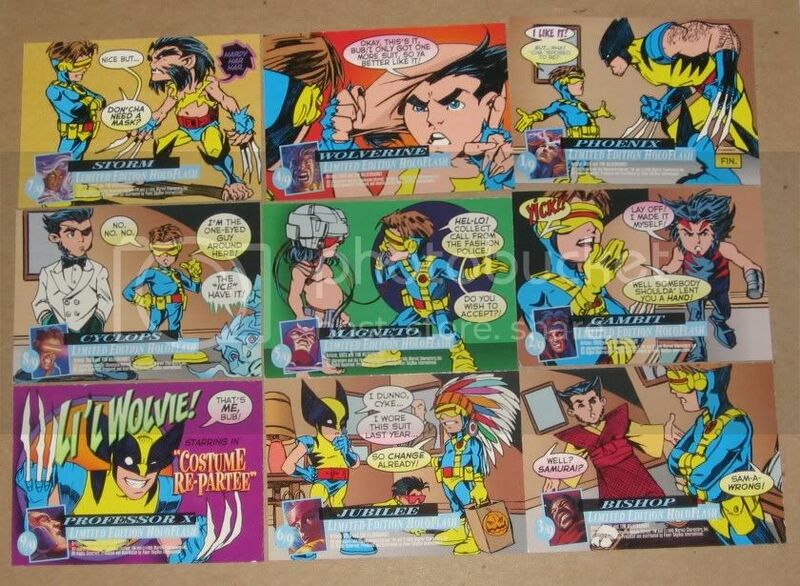 The set of Fleer Ultra X-Men: Wolverine by Fleer/Skybox 1996. I bought 3 boxes some weeks ago and opened them last week. The box looks like a classic Jumbo Box (see Figure 1), but it only has 6 cards by pack and the box had 36 packs. I bought 3 boxes of this series because is really rare and scarce to find this series. 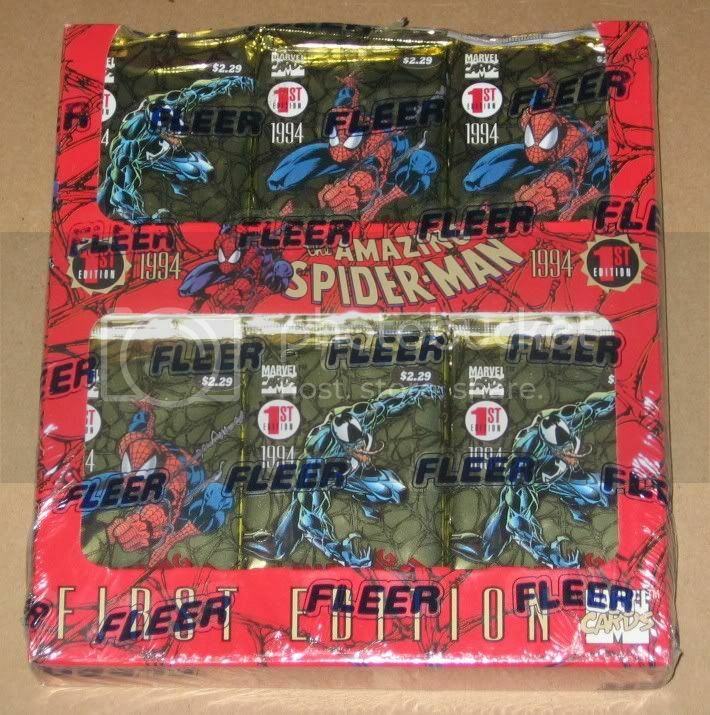 Figure 1- The classic jumbo box, like this 1994 Fleer Spider-Man. The base set is composing of 90 cards. It has 2 types of inserts sets: Holoflash (1:4 packs), and Mirage/Lenticular (1:24 packs). Every box I got 1 basic set and Foil Set, and a Lenticular card. I got lucky to complete the Lenticular set and I get one extra in other box. 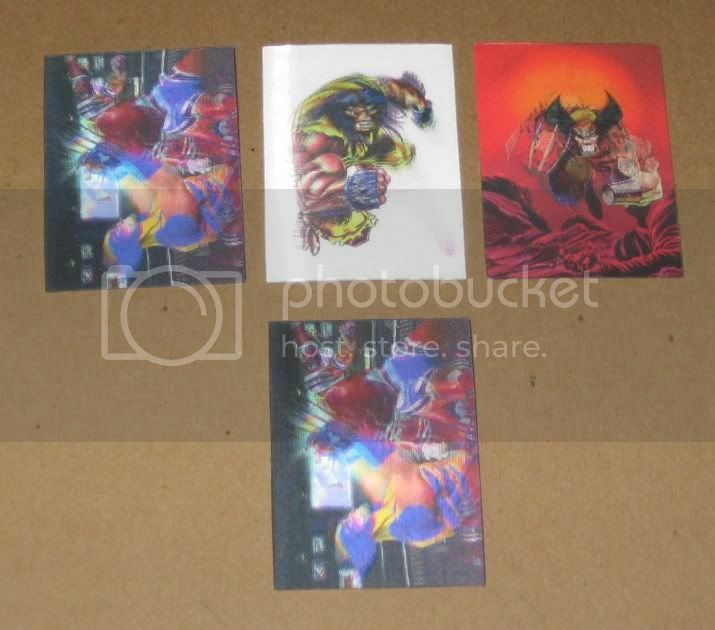 So from 3 boxes I got 4 Lenticular Cards (see Figure 2), 3 Holoflash Sets & 3 base sets. Figure 2- The Lenticular Cards. The base set (see Figure 3) illustrations is great paints from different artists. I can’t see the artist firm in the artwork like other series of cards, but it is found in the checklist. Base set “Weapon X” by Glenn Orbik, “Department H” by Ken Kelly, “Second Genesis” by Tom Kuffin, “Japan” by Julie Bell & Boris Vallejo, “Allies” by Dave Dorman, “Madripoor” by Mark Texeira, “Mojoworld” by Tom Fleming, “Enemies” by Cliff Nielsen, “X-Men” by Joe Jusko, “Age of Apocalypse” by Marc Sasso, and “Savage Beast” by Brian Stelfreeze. And 9 Chase Cards or Holoflash Cards by Greg & Tim Hildebrandt. 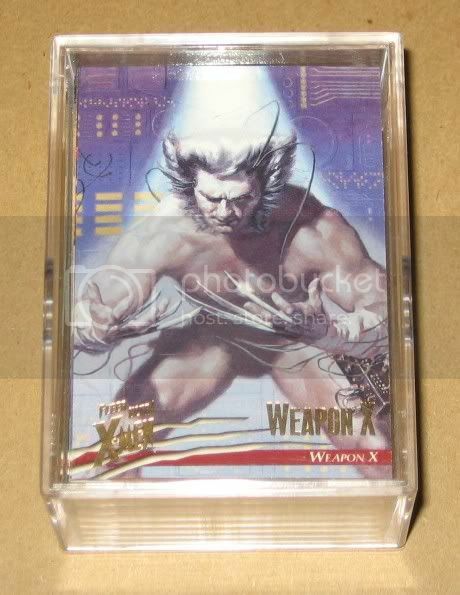 Contrary to the past X-Men Fleer Sets were you find the Bio or background of the story. In the back panel of the cards you are going to find a little comic book story of Savage Wolverine & Elektra in the Mojo’s World. Figure 3- The base set. The Holoflash Cards (Figure 4 & 5) are a big puzzle that looks like the Fatal Attraction moment when Magneto pulls out the Adamantium from Wolverine. In the back is a little adventure of Lil Wolverine getting ready for a Halloween Costume Party. Figure 4- The Holofash Set (front view). Figure 5- The Holofash Set (back view). The condition of the cards is the bad story. In the middles ‘90s Skybox & Fleer began to implement glossy surfaces and gold ink to the cards. Many of these cards act like I was Magneto who designs them. The cards like to stick together and sometimes when you separated them, they loose parts (see Figure 6). The X-Men Wolverine set is a great example. Near 50% of the base cards were in that condition. The Chase Cards were fine because they don’t suffer this problem. They were always packed as the last card in the pack. Figure 6- The damage cards. The set has excellent artwork and the Chase Cards aren’t something great, but like all cards from ’90s the focus was the base set. The design & illustrations are excellent. The condition of the cards is poor. Because if you open a “sealed box”. You expect to get near 70% of the cards in “Near Mint–Mint” Condition. 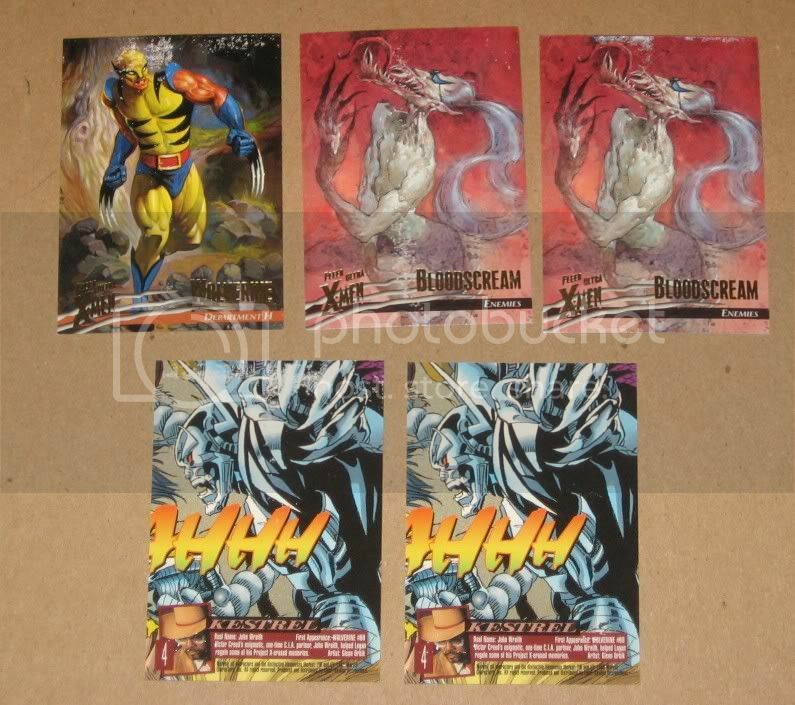 As far the only “glossy” cards I found with the “Magneto Problem” are the 1994 Flair Marvel. -	Base set illustrations are and made by famous artist. -	The artwork is fantastic. -	Easy to made the Chase Set. -	Difficult to find the boxes. -	Condition of the cards. -	Mirage (Lenticular) cards aren’t the best Chase/Insert Cards. Nice breakdown, I opened my boxes of these a LONG time ago (when they first came out), but I remember the ratios of the insert cards being very similar. I did want to note that back then, the cards from the packs were pretty much all in mint condition. The damage from the cards sticking together only happened after a few years. It is especially bad with Marvel Silver Age made by Fleer/Skybox in 1998. The problem is mostly that the cards are UV coated on both sides and the mixture they used was unstable somehow. I had sealed packs of Marvel Silver Age stored in mild temperatures with no humidity, and by 2001 or so, I could tell the cards inside had already stuck together, the cards inside felt like one thick card. Unfortunately pretty much all of the cards are damaged including the insert except (LUCKILY) the best cards in the set: auotgraphs and sketch cards. These cards are not high gloss on both sides, so they should be fine, even in boxes (likely all of those remaining sealed) filled with otherwise ruined cards. One last thing about this: Anyone who has sets or singles of Marvel cards made between 1994 and 1998 should store them loosely as possible as they can stick together even out of the packs should they be stored too tightly together. chesspieceface, you are right 100% about the series from 94 - 98. The cards outside the packs stick together. Specially if you store them in Ultra Pro clear boxes. But in packs. I remember to open a Batman Saga pack when it got out in the 90's and some cards were stick together. In other hand I opened some months ago a Sealed Box of the same series and didn't had that problem. From the new series I got these months. 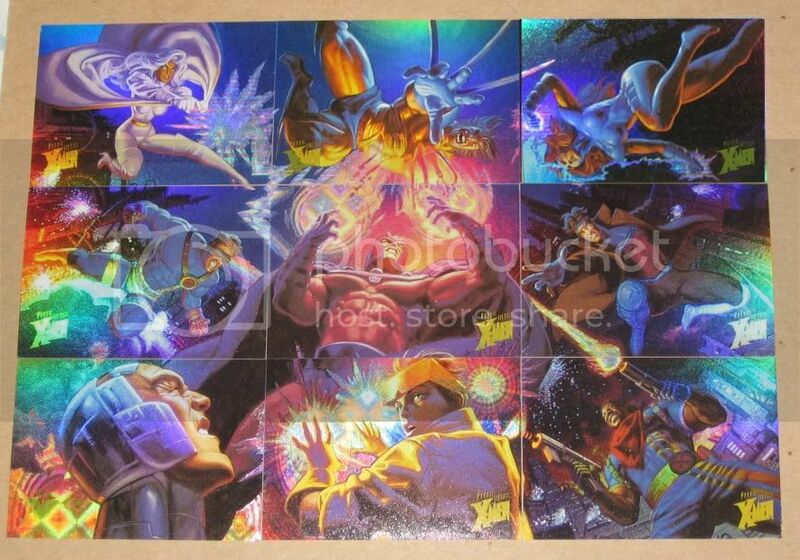 The Marvel Masterpieces Set 3 get stick together. So the problem is still even in the 21 century. As far I like the UV Coat from Justice League Archives. It isn't so glossy but the card looks fine.